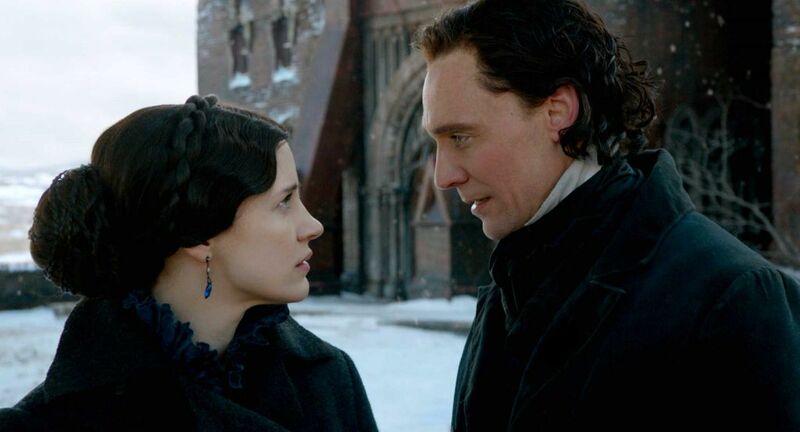 Crimson gushes from both walls, and people in Guillermo del Toro’s mystery/thriller Crimson Peak. Del Toro’s latest piece is puzzling, yet satisfying, predictable, yet shocking. Crimson Peak is jam-packed full of contradictions, and hair-raising action that will keep you (cowering) on the edge of your seat. Edith Cushing, portrayed by Mia Wasikowska, is the spirited daughter of a highly respected businessman, who’s looking for her place in the world. Edith’s life plans become blurred once she becomes entranced by Sir Thomas Sharpe, portrayed by Tom Hiddleston, and becomes his bride. Soon, the newlyweds relocate to The Sharpe’s desolate gothic mansion in scenic England, along with Lady Lucille, Thomas’ cunning sister. From seeping clay, to perforated rooftops, the hall is a tremendous mess; deteriorating from the inside out, much like Edith’s sanity as she starts uncovering apparitions, and her new family’s ghosts, and dark secrets. As Edith unravels the mysterious truths, she comes to face more demons than just ghosts in her daydream turned nightmare. Before the movie is delved into, it’s important to consider Guillermo del Toro’s legacy in the film industry. Del Toro, the creative mastermind behind a plethora of world-famous blockbusters, including Pacific Rim, Hellboy, and Pan’s Labyrinth (to name a few). Del Toro has a reputation in the film circuit, as a prolific innovator excelling in the dark, fantasy realm. Naturally, expectations were high. Fortunately, the expectations were not only met, but also exceeded. The expert cinematography, and stunning imagery was enough to take your breath away, as was the gory, and (at times excessively) striking cinematography by Dan Lausten, working in tandem with Bernat Vilaplana’s mostly smooth film edits. The plot, along with the beautiful images created a “ghost” the audience is haunted by, and will remember long after the film’s credits rolled. There were a few interesting shots throughout the feature, in which one can assume the artists were exercising their originality and unique ideas. However, a few of these shots distracted from the over-all mood of the piece. For example, a reoccurring transition was the “iris-round close out”, in which the picture is focused in a circle around the main image on the screen, and fades into it, resulting in the rest of the screen becoming black. To clarify, this transition is most commonly associated with the classic Looney Toons, and works of a similar caliber. It is for this reason that it proves interesting that this transition was so frequently utilized throughout Crimson Peak. Unfortunately, these transitions, and others similar tended to add a certain cartoony aspect to the film, which is not what del Toro seems to strive for. There’s a fine line between cartoony and fantasy, and at times, Crimson Peak was trifling with said line. Another minor objection throughout the film was another common theme; predictability. Interestingly enough, certain plot points are actually so predictable, they became unexpected (as it would just make too much sense), so it worked for the film in multiple cases. Calling every shot becomes tedious quickly, but somehow slightly satisfying.